Ontech Systems provides efficient, reliable IT support services to Mequon based businesses as well as the Greater Milwaukee area. In today’s fast-paced business environment, having up-to-date, reliable IT at your fingertips is a must. Whether you need us to act as your outsourced IT support department or you prefer we fill in the gaps of your existing in-house IT department, Ontech Systems provides you with comprehensive IT support designed to fit all your needs. With a 98% client retention rate over the past 10 years and no long term contracts; our clients stay with us because they want to, not because they have to. Ontech’s IT services range from managed IT services, disaster recovery and VoIP to virtualization, server maintenance implementation and more. What sets us apart from other IT support providers in Mequon? We’re highly responsive: Many of our clients share unpleasant experiences they’ve had with other IT consultants who were unresponsive to their needs – even in urgent situations. Because we understand downtime translates directly into profit loss for most businesses, we guarantee we will respond to your request by phone or email within 1 hour of your request during regular business hours. Our techs avoid technical jargon: We keep you well informed of the services we provide in terms anyone can understand – no matter what your technical knowledge or expertise. No long term contracts: Our 98% client retention rate speaks to the level of quality IT services we provide to our clients – no long term contracts are needed. We’re Pro-active: With our pro-active approach, we learn about your business and create a customized plan that fits your business needs, goals and concerns. We integrate your overall business goals and long-term growth into a customized, comprehensive IT support plan that can adapt as your IT needs grow or change in the future. As a first step, we invite you to request a free Network Discovery. We will evaluate your current network and offer ways to improve the productivity and efficiency of your Mequon business. When you request a free Network Discovery, one of our consultants will come out to your Mequon business and evaluate your network, infrastructure, server, PC’s, backup and security performance. Once their evaluation is complete, our consultant will answer all your questions and share their findings with you. 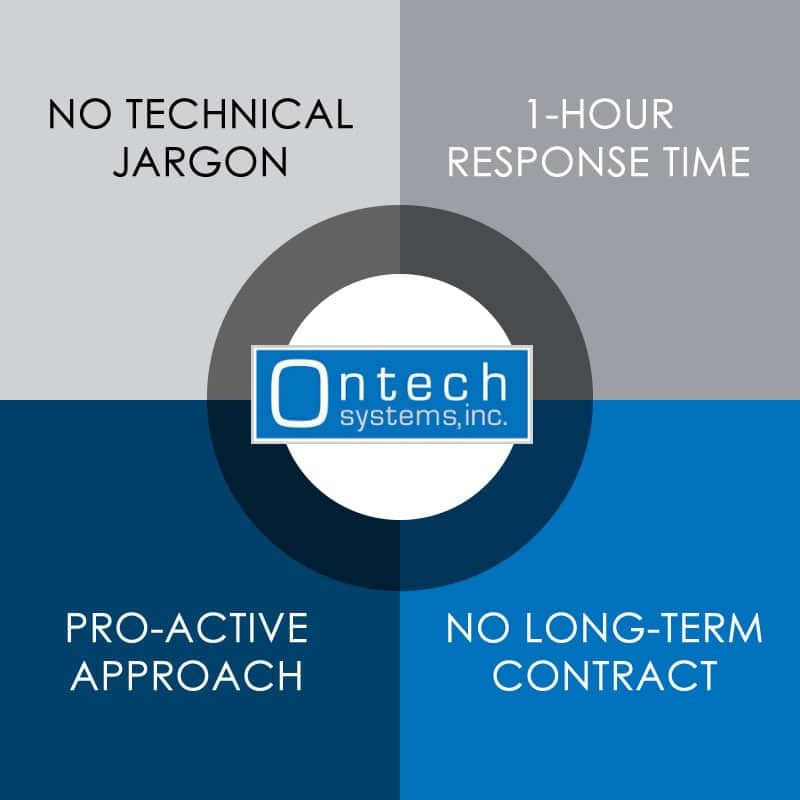 Schedule a free, no-obligation Network Discovery with Ontech Systems today by calling (262) 522-8560 or requesting your network evaluation online.